Starting a blog might be the perfect side hustle – you can do it on your own time, build multiple passive income streams, meet new people, and unlock tons of new opportunities. I made over $1 million as a result of launching the Millennial Money blog 3 years ago (I’ll show you how below!). Also, make sure you sign up for my Free 7 Day Blogging Side Email Hustle Course to get the exact strategy I used. I’ve also made a ton of new friends and been invited to partner on many new projects that I am excited about. Here’s how starting a blog has helped me build a richer bank account and a richer life. There are many reasons to start a blog, but before you start yours I recommend you take out a piece of paper, or your phone, and write down why you want to start a blog. It can be anything. Maybe you want to build a profitable blog, build a brand, or connect with like-minded people. Write down your goals. Save this and look back on it when blogging gets tough. Because blogging consistently can be tough (but it does get easier over time!). Starting a blog is easy. Here are the 5 steps to launch your blog in less than 10 minutes and for less than $6/month. 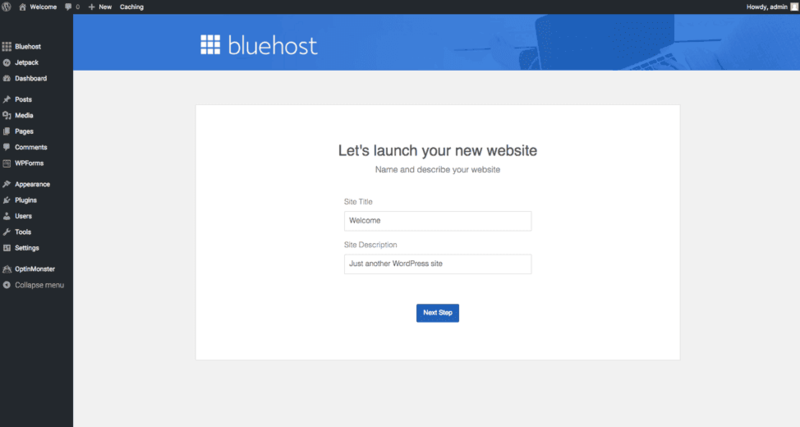 You can literally launch a blog in less than 10 total clicks at hosts like Bluehost! Yup, 10 minutes, 10 clicks, $6/month. 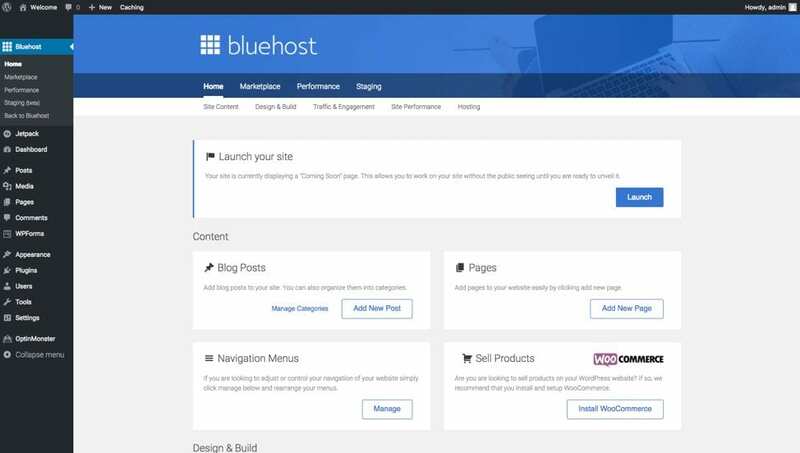 It’s also super easy to get started at because Bluehost automatically walks you through every step of the process from buying the domain to set up your website – in 10 clicks or less! Get 50% Off with this exclusive link only available through Millennial Money. Once you find a domain you like, then buy your domain, set-up your hosting, and install WordPress (the best content management system for bloggers). This will all take you less than 5 minutes. Get 50% Off with this exclusive link only available through Millennial Money. Click the “get started now” button and let’s get started! (see above). 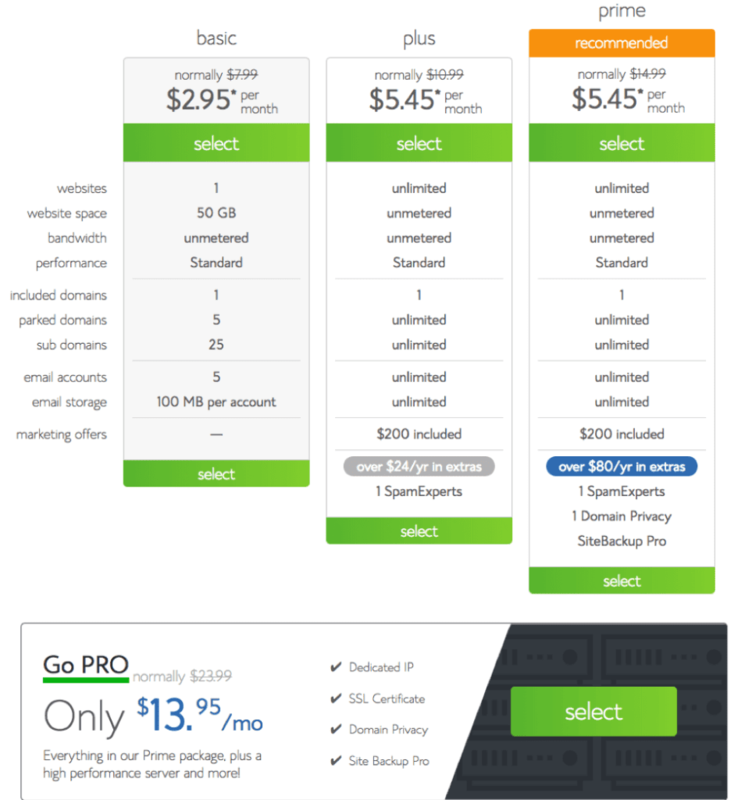 Select a hosting plan that fits your needs. 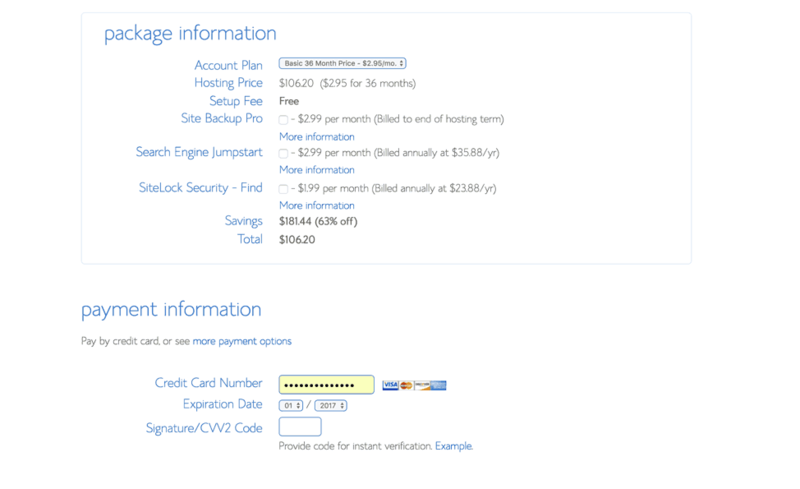 On Bluehost, you can select the cheapest plan option and then always upgrade later if you need more bandwidth. But if you are going to take blogging seriously, you should consider an upgraded package. A typical formula that I use when coming up with domain names is [fun word + word related to your niche .com] or [memorable phrase about your topic]. 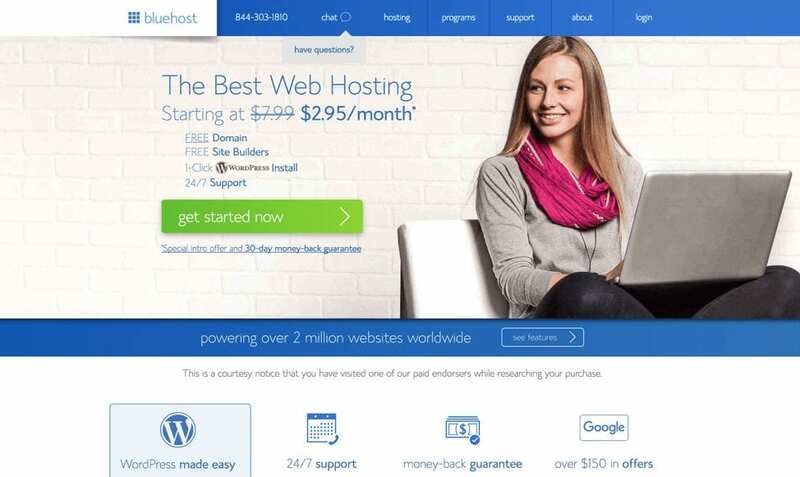 Some of the great domain name examples based on these two formats are moneyboss or budgetsaresexy. START SEARCHING FOR YOUR DOMAINS NAMES BELOW. 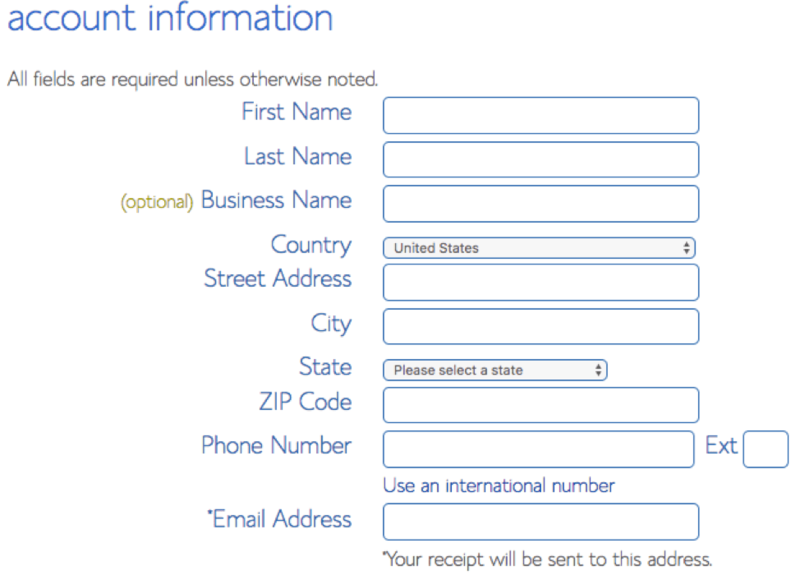 Don’t spend a ton of time on this step, you can always change the domain name later. If you already have a domain name, type it in the “i have a domain name” step. 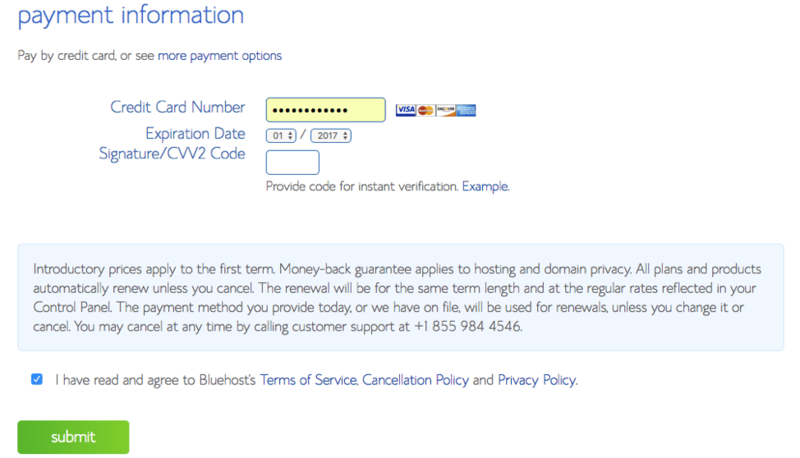 Bluehost is generous enough to throw in a FREE domain name for every new hosting account created. Review the package information below and decide what term/add-ons are desired. The biggest bang for your buck is on the 60-month term, but you can choose 36 months, 24 months or 12 months – whichever you feel comfortable with. 60 months is definitely the best deal though. Congrats, your hosting account has been created! 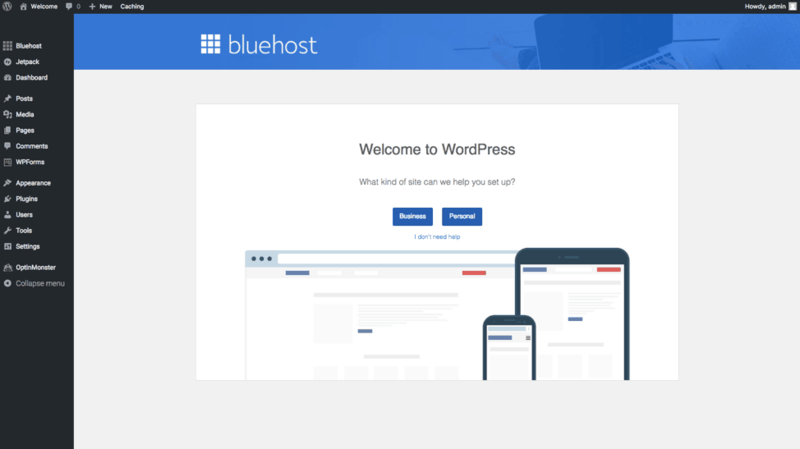 Bluehost will send you a welcome email confirming account and FTP information. Create your password. Make sure to review the requirements for creating the password. If you need help you can always click the “Suggest Password” option. Regardless, I recommend writing it down just to be safe. You’ll end up needing it later on. 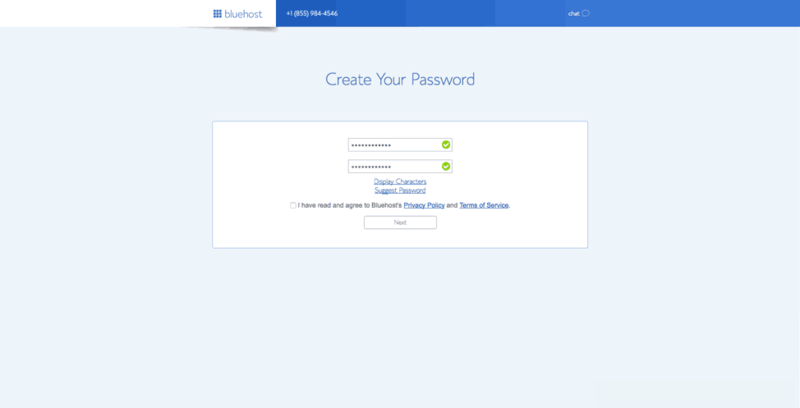 Go ahead and log in and start getting familiar with your new Bluehost account. if you haven’t yet, sign up here Get 50% Off with this exclusive link only available through Millennial Money. After you secure your domain WordPress will automatically install (you don’t need to click anything!). 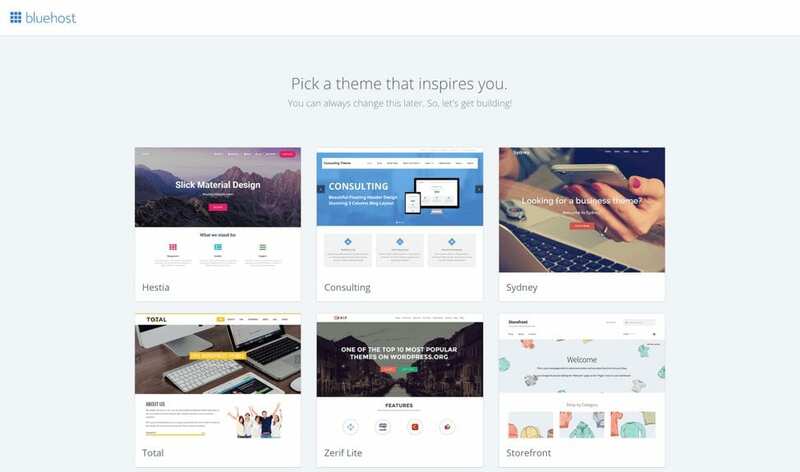 All you need to do next is pick a theme that you really like – there are a ton of designs and more are added regularly. All of these themes are free and don’t worry you can always change your theme later, so choose the one you like best now. Now that you’ve picked a design for your blog the next step is to get into WordPress so you can start writing your first post! Next, you need to decide whether your blog will be for business or personal use. Next, you will see where you can manage your WordPress posts and plugins. Last step. Decide on your blog title and description here. Don’t worry you can change it at any time. Step 4. Now write your First Post! Congratulations you’re a blogger. To learn how to make money blogging sign up for my Free 7 Day Blogging Side Email Hustle Course to get the exact strategy I used. Alright, now that you’ve launched your blog, let’s talk about how you can start making money blogging. Blogging can be a great side hustle and some bloggers make a lot of money. So can you, but you’re really going to have to hustle. Like really hustle. First, you can’t expect to much money from your blog for at least the first 6 months. During the first 6 months, you will need to spend most of your time writing posts, commenting on other blogs, and connecting with other bloggers (through guest posting and other networking). In order to make money you need traffic and building traffic takes time. A lot of new bloggers think they will quickly make money on advertisements and affiliate links (promoting products that pay you a commission), but you need a lot of high-quality traffic to make money with both advertisements and affiliates links. The fastest way to make money with your blog is to stop thinking about it as a blog and start thinking about it as a platform. I view Millennial Money as my own platform. You should view your blog as a platform too. When you build a platform the possibilities for making money with it expand significantly. Millennial Money allows me to share my personal journey building my net worth from $2.26 to over $1 million in 5 years and wealth building strategies, but it also allows me to build my network, and open new doors to consulting and partnership opportunities. BUT – because of the network I have built and an audience that companies are trying to reach (Millennials interested in personal finance), I am able to make money using the Millennial Money platform in a bunch of ways. And I am coming up with new money making ideas for this platform every day. I currently make money on Millennial Money advertising ($1,200/month), through affiliate commissions ($1,500+/month), participating in Twitter chats ($250-$750 each, reviewing products I test and like ($1,000+), as well as consulting opportunities ($500+ per engagement). I also reject a lot of money making opportunities to protect the brand. Just recently one Student Loan company reached out and offered me $2,000 to write an article about their new “student loan forgiveness scholarship,” which I declined after researching it. I also reject a lot of guest post requests from content marketing companies offering $500+ to place an article on Millennial Money. One piece of advice: don’t sell out and post crappy content. Your readers can tell and it kills your credibility. Since starting the Millennial Money blog I have also rejected a $45,000 offer to purchase the domain, landed one large consulting project from a company interested in strategies to target Millennials, and others directly from bloggers who want to grow blog traffic using SEO. When you view your blog as your platform, the opportunities for making money go well beyond advertising and affiliate revenue. Then as you continue to build a bigger audience and more recognizable brand the money-making opportunities will continue to expand. Blogging has changed my life. In fact, the daily discipline of blogging has had profound impacts in many areas of my life, but especially on my financial life. In order to write quality blog posts you not only need to share your personal experience, but you also need to do your research. I learn a ton reading about others financial strategies, which has helped me make small profitable tweaks to my own. If you want to build wealth and achieve financial independence, the fastest way to do it is build daily habits that maximize your earning, saving, and investing gains. Very few people hit it rich, but I truly believe that anyone can become rich through consistent saving and investing habits. Many studies have shown that you are more likely to accomplish your financial and other life goals if you are held accountable. Starting a blog and connecting with a community is an incredibly effective way to build accountability and build new habits. Both will make your life richer. To learn more sign up for my Free 7 Day Blogging Side Hustle Email Course. That’s fantastic. Good on you for blogging and making it a possible career. That is my end goal, I wish to have this happen to me, one could only hope! I am still new to the game, I am trying to learn and posts like this help me on my way. Appreciate it. I’m glad you found it valuable. Best of luck! Wow! What a post, Grant. I truly wish I would’ve came across this prior to making “Refined & Defined: The gentleman’s guide” blog, But this gave me priceless insight. Thank you so much, and I sincerely look forward to reading more of your posts. The knowledge is invaluable. Thanks Cameron. Appreciate the positive feedback. I look forward to following your blog as well. I appreciate your approach to help others , I`m starting a blog. thanks. Nice. Good luck with your blog! Share it with me when it launches. For sure Pradeep. Thanks for stopping by. Hey! I loved this so much thay I started a blog: Quickly Capable. It is about taking on ridiculously large learning projects in an unrealistically short amount of time, my fist challenge is to see if I can gain fluency with Spanish in a month. I don’t expect every challenge to be a success, but that is part of the fun. Thanks! Thanks Harrison. Keep me posted! Good luck. what are your thoughts for Blogs about health and fitness, I want to Blog but know nothing about finance. I want to write about health and daily day to day life philosophy (for e.g. motivation and success). You can blog about anything. It doesn’t have to be finance! The only way to be successful with a blog is blogging about a topic you love, because it is a lot of work. Those sound like great topics! Great blog! I’m new to blogging so I really appreciate your info. I have so much to learn…..I definitely will follow you. Thanks Lee. Blogging is tough at the beginning, but gets a lot more fun as you find a rhythm, start building traffic, and start making money 🙂 I am most surprised by how natural writing has become – I actually started to crave time to write, which I didn’t expect. Now I love it. This post, along with just about every other one of yours has been extremely helpful and inspiring. I plan on starting a blog in the near future and I’m trying to pin down exactly what I want my content to be about. I’m very interested in personal finance and wealth building, however I am not sure I am knowledgeable enough on the subject to start writing posts about it. I will continue to read your posts and hopefully find the right direction to take it. Thanks for the insights. Thanks Mich. I appreciate the kinds words. You don’t have to blog about money – just find a topic that inspires you most that you can keep writing about. That’s the key – it will only be successful if you find a topic you love. I love your website! I can relate to a lot of your posts. I also have a passion for personal finance too! I just started my blog last week. It has been quite the learning curve. This post helps a lot. Thanks for writing honest, down-to-earth stuff..
For sure. Thanks for reading Lara. Just checked out your blog – it looks great. I can’t wait to follow your journey. Thanks for the great post! I’m a new blogger too and posts like this are super encouraging. This is one to bookmark for sure! great post thanks a lot. I have launched my blog on the back of reading this. please check it out and tweet it if possible. I’ve been blogging for a while and in my opinion what you said about ‘don’t build a blog, build a platform’ is spot on. I’m 100% into creating your own products, building a funnel and making your money that way. You’re correct when you said that making money from ads and affiliate links requires a lot of traffic. I had a news site. OMG that thing needed loads of traffic to make even a few hundred bucks. I sold it. Thank you for this! Reading this post helped inspire me to start my own blog which I just recently started posting to! Thanks for all that you do! This was the best step-by-step guide I’ve seen to starting and monetizing a blog, It inspired me to start working on mine months ago and thanks to you I was able to launch last week! Thank you. Looking forward to following more great content. Write at least 2-3x a week when you start. Good luck! Hey Grant, Had been meaning to check out Millennial Money for long and am glad I finally did. I especially like your point about blogging keeping you accountable in your financial journey. I am personally experiencing this in my blogging journey at Elementum Money where I am also looking to maintain a discipline of 3 posts a week. This post made for a great read. Thanks. This is one of the best posts I’ve seen about starting a blog with intent to monetize. I’ve been trying to find the most simplistic way to do so over the years. I write – ALOT – and have had a few different incarnations of blog types, but now own my namesake domain through Word Press. This is quite frankly one of the most simplistic views for people just starting. I’d love to know if you have a post taking it one step further into the ins and outs of the niche of monetizing a blog! I just launched my personal finance blog yesterday and I am so glad that I can enter my thoughts into a little white box with a blinking little line and an article like this pops up. Thanks, Grant, for writing this post and giving me some direction on where to get started with my new blog. Thanks Scott. Good luck with your new blog! hi Grant, I just started my blog at theaseaninvestor.com thanks to the inspiring experiences you shared in your blog post. I just started few days ago but I am very excited about all the possibilities it can offer. Thank you for sharing your experience. It is definitely very difficult starting out as a blogger. There are so many things to concentrate on at once – content, design layout, marketing, ideas all hit you at once. I would say that within the first 6 months, not only do you not make anything, but lose money from hosting, time and if you did any paid advertising/marketing campaigns. Personally going through it right now. I can easily see why many bloggers quit after 1 year of not garner major traction. You could write your best articles and still don’t get much of a following. A lot of self doubt comes into play. Hey Grant! I discovered your site the other day via a Business Insider repost of one of your articles, and I love what I’ve read so far. I don’t know if I have as much hustle in me as you, but I’m seriously considering starting a blog as well. What’s up Grant! Been reading for a while now not only on your blogging advice but on your financial freedom and investing advice as well. I am definitely considering blogging as a side hustle and have been seriously researching on how to get started and how to keep it successful and making sure people will want to read it. Being a 3rd generation auto body man, my life passion has always been in cars and just about anything with an engine and wheels and mechanics, so I’m positive that’s the direction I would like to take my blog. My only problem is, I’m not too sure where to start! Any advice you could give me would be greatly appreciated and used for years to come. Thanks for all your awesome content and helping out young people like me and congrats on your immense success! Thank you for this helpful and informative post! Awesome post ! Thank you very much. Goog job!